Flooding in the Midwest, triggered by an intense “bomb cyclone,” has devastated parts of the region, which has been plagued by flood events in recent decades. Floods are triggered by extreme rainfall events, often combined with ground conditions, such as saturated or frozen ground, that make it harder for water to percolate down into soil, which increases runoff. Global warming has the potential to intensify the Earth’s water cycle, which will alter the quantity, frequency, intensity and duration of rain and snowfall. As my research and work by others has shown, all of these changes raise the risk of floods for Midwest states. There is strong consensus among scientists that climate change will make many parts of the world wetter. This happens because higher temperatures increase the rate at which moisture evaporates from Earth’s surface, and warmer air holds more moisture than cool air. For every 1 degree Celsius of warming, the moisture-holding capacity of the atmosphere increases by about 7 percent, based on well-established laws of physics. As the air becomes moister, we can expect more precipitation – but the increase is not uniform. Assuming that wind patterns don’t change significantly, more moisture will be transported into some regions under the influence of storm tracks. This means that storm-affected areas are likely to experience larger-than-average increases in precipitation and flood risks, while areas located away from storm tracks are likely to have less precipitation and greater risk of drought. The U.S. Midwest is located in a convergence zone where prevailing winds blowing from the east and west meet. The polar jet stream blows from west to east along the boundary between warm and cold air and regularly brings in storms, particularly in cold seasons. Using data from the U.S. Historical Climatology Network, I have shown that from 1951 to 2013, mean precipitation for the United States increased by 1.6 percent per decade. In the Midwest, however, it rose by about 2.1 percent per decade, and winter precipitation increased by 3.7 percent per decade. About half of this growth was caused by more frequent storms, and the other half can be attributed to an increase in storms’ intensity. I have also used high-resolution regional climate models to simulate future climate change in the Midwest for the period 2040-2070 compared to 1970-2000. In this study I found that mean precipitation across the region is likely to increase by 8 percent by mid-century, and winter precipitation is likely to increase by as much as 12 percent. The northern part of the region could see an even larger increase, likely due to greater evaporation from the Great Lakes resulting from higher temperatures and less ice cover in winter as the region warms. With more moisture in the atmosphere, storm systems are likely to produce heavier rainfall events. Enhanced moisture in the atmosphere also increases latent heat – warmth released by water vapor as it condenses into liquid drops in the air. This heat provides more energy to increase the intensity of storms. More intense precipitation events are predicted to happen in Midwest states. These factors mean that climate change is likely to cause a disproportionate increase in heavy precipitation events in the Midwest, a trend that is already apparent when looking at historic climate data. From 1951 through 2013, my study found that light and moderate precipitation across the Midwest increased by about 1 percent per decade, while heavy precipitation increased by 4.4 percent per decade. Average precipitation for the region is projected to increase by about 8 percent by mid-century, but heavy storms – those of a scale only likely to occur once in 25 years – are projected to increase by 20 percent. All of these changes will significantly alter flood hydrology. 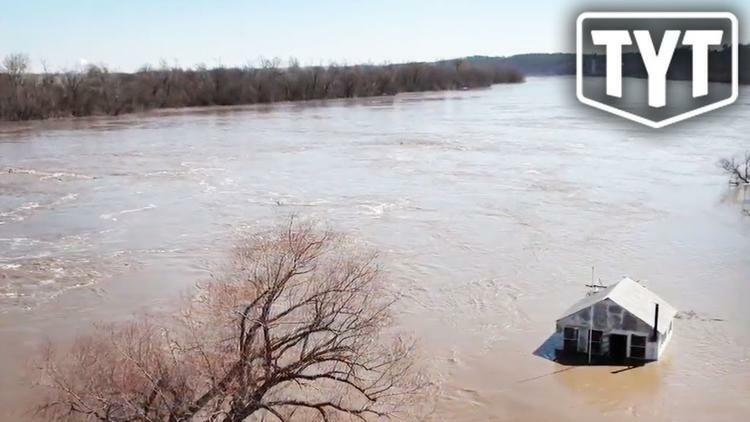 A 2015 study that examined discharge data from 774 U.S. Geological Survey stream gauge stations across the Midwest from 1962 through 2011 found that 34 percent of the stations showed significant increases in the frequency of flood events. The most pronounced increase occurred in springtime for floods associated with snowmelt, rain falling on frozen ground and rain-on-snow events. In addition to increasing precipitation, this analysis showed that earlier snow melting and changes in the rain-to-snow ratio caused by higher temperatures are also driving the strong increase in Midwest spring flooding. Another study projected shifts in flooding due to climate change and calculated how frequently an average 20th-century 100-year flood – that is, large enough to have just a 1 percent chance of occurring in any given year, or once in a century – is likely to recur in the 21st century. For most of the Midwest, the authors estimated that the probability of such floods was likely to double in the 21st century, so that what was once a 100-year flood can be expected to occur on average every 50 years. A third study, published in 2016, examined how climate change could alter streamflow in the Northeast and Midwest. The magnitude and timing of streamflow can affect water supplies and quality, infrastructure systems and aquatic life. This study found that over this century, average 100-year three-day peak flow levels were likely to increase by 10 to 20 percent for the Midwest region. Meanwhile, people in Nebraska, Iowa, Wisconsin, Minnesota and South Dakota affected by the most recent storm are assessing the damage. NOAA earlier this month forecast that the historic floods will be followed by more rain and flooding this spring. Current flood waters are expected to remain for months.